Something hot is happening next week! I am ready for it how about you? This 15th February 2014 it’s going to be a sensational Ibiza dance party at Sunway Lagoon Surf Beach withTaiwan’s sensational Hip Hop band Da Mouth and DJTenashar Live Concert sponsored by Hotlink 4G the latest fastest and widest 4G network. Hey! I have 5 Pairs of VIP Tickets worth RM288 per ticket to Hotlink 4G Da Mouth & DJ Tenashar Live @ Sunway Lagoon to Giveaway to you. I am sure you would not want to miss this opportunity to experience the Ibiza festival atmosphere concert and dance music festivities that incorporates music with fun in the water and at the same time having fun whilst splashing in the water. Recently Maxis Berhad (Maxis) got its Chinese New Year celebrations underway with the launch of Hotlink 4G, enabling their prepaid customers to experience even faster internet speeds on Malaysia's first and widest 4G network. Today, more and more people are accessing richer content on their devices, such as video and music streaming as well as data-heavy websites. To activate Hotlink 4G all you need to do is to purchase #Hotlink SIM pack for RM8.80 and do a 4G SIM swap at any Maxis Centre nationwide. Then you need to subscribe to a 1GB or 3GB monthly mobile internet pass priced at RM30 and RM68 respectively, to start enjoying faster speeds on Maxis’ 4G network. To subscribe to the passes, you need to dial *100# from your mobile phones. Plus you will also get 50% more data if you purchase the monthly mobile internet passes from today until 28 February. So hurry don’t miss it ok. Interesting! Maxis’ Chinese New Year and Hotlink 4G campaign kicked off with Maxis’ Chief Executive Officer Morten Lundal, together with the God of Prosperity (Choi San Yeh) and a group of 20 Roller Bladers, handing out ‘Ang Pows’ to the public at the KLCC Maxis Centre and around the KLCC fountain area. 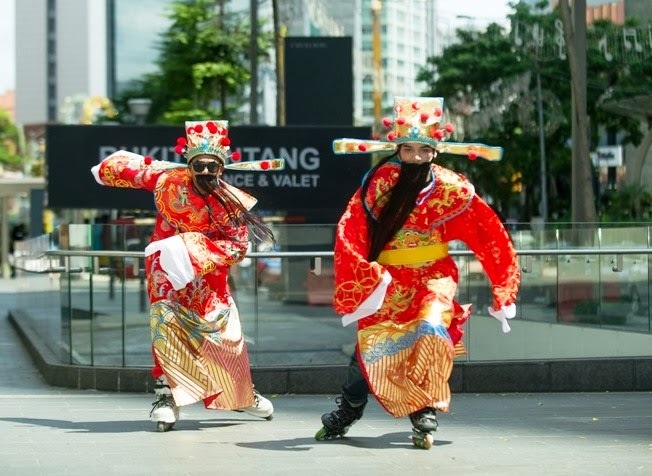 If you miss the AngPow don’t worry over the next few weeks, the roller bladers will head towards roadshows in the Klang Valley, Penang and Johor Bahru during which the public can participate in exciting games and activities. The final roadshow will take place from 7th till 9th February 2014 in Sunway Pyramid, where customers will stand a chance to win tickets to a special Hotlink sponsored concert, featuring Taiwanese hip hop band Da Mouth and Hong Kong-based DJ Tenashar, on 15th February 2014. Subscribers of the 1GB or 3GB Mobile Internet passes can also participate in SMS contests to stand a chance to win VIP tickets to the concert. The concert headliner will be Da Mouth from Taiwan whom are made up of MC40, DJ Chung Hua, male vocalist Harry, and female vocalist Aisa. They are considered the Asian The Black Eyed Peas due to the group's diversity. The band's Chinese band name directly translates into "big mouth". They released their self-titled debut albumDa Mouth on 16 November 2007. The group won Best Singing Group at the 19th Golden Melody Awards in 2008 and at the 22nd Golden Melody Awards in 2011. There will also be Malaysia’s very own DJ Nikki a versatile DJ that incorporate tech house, house to electro as well as her more traditional techno fare and making for consistently exciting. DJ Leng Yein former Miss Malaysia World finalist, an actress, song writer, tattoo artist, model, designer, brand ambassador, performing pianist, beautician, host and Singapore’s DJ MISTY by emphasizing on impact mixing with smooth, clean transitions and a tinge of cutting and chopping in her tight sets. These are the simple mechanics to win 5 Pairs of VIP Tickets to Hotlink 4G Da Mouth & DJ Tenashar Live Concert @ Sunway Lagoon. I will be choosing 5 winners and each of you will receive a pair of VIP tickets to Post Valentine Beach Party & Live Concert! All the best! All you need to do is to tell me why you want to go to Da Mouth & DJ Tenashar Live Concert, leave your name and valid email address.